If a tooth is weakened because of tooth decay, cracks, or chips, then a dental crown might be needed to strengthen the tooth. Crowns are also often used if a tooth has been treated with a large filling, such as after a root canal because there isn’t a lot of tooth remaining after the treatment. The dental crown is beneficial to restore the tooth so that you have full function and a natural appearance to your smile. 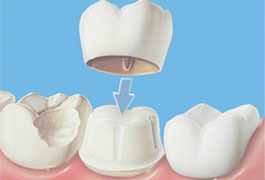 Dental crowns usually require two or three visits to complete the procedure. During the first visit, the tooth will be prepared, and then an impression is created using a putty or paste. That impression is sent to the dental lab where the crown is created. You will have a temporary crown in your mouth while the permanent is being made, then you will return to the dental office when it is time to secure the permanent crown in your mouth. Cosmetic bonding is a treatment that can be used to change the appearance of your teeth. This cosmetic method involves material that is placed on the surface of the teeth; then the material is sculpted to create the desired size and shape of the tooth. Once the ideal shape has been formed, then the material is hardened and bonded to make it look natural. If you are looking for a conservative way to overcome blemishes on your teeth, then you might consider the benefits of bonding. 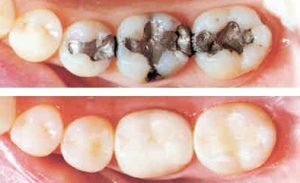 This treatment is often used for dental problems such as misalignment, gaps or spaces, poor shape, discoloration or stains, cracks, and chips. The goal with bonding is to create a natural appearance, creating a cover-up for smaller dental problems. Typically, the bonding treatment can be completed in one appointment. It is a fast and cost-effective way to improve the appearance of your smile. One of the fastest ways to transform the appearance of your smile is with dental veneers. This treatment can help you overcome dental problems and create the smile that you have always dreamed about! When you choose porcelain veneers as a cosmetic dental treatment, you can talk with the dentist to choose the length, shape, size, and color of your teeth. Veneers can be used to overcome minor imperfections such as cracks, gaps, chips, and more. Dental veneers are designed for aesthetic purposes, so they fall within the category of cosmetic dentistry. During your first appointment, the dentist will prepare your teeth and then a mold is created to shape the veneers. Then, you will need to come back to the office for a second visit, and we will bond the veneers to your teeth. The final result is a natural, beautiful smile because the veneers will be visible when you smile and open your mouth. An uneven gum line or a gummy smile can have a negative impact on the overall appearance of a person’s smile. When you smile, you want to show people your beautiful teeth instead of a smile with unattractive gums. We can use a laser treatment to contour the gums in the right way to match your teeth. The benefit of using a laser for gum contouring is that the laser is more comfortable, and it is less invasive compared with methods that were used in the past. The laser is used to shape the gums into a symmetrical line and eliminate overgrown gum areas. When a laser is used for gum contouring, you can enjoy the benefits of a comfortable experience and fast healing after the appointment. Examples of common gum treatments that are completed with a laser include both periodontal gum therapy and a frenectomy. These treatments are determined on a case-by-case basis for each patient. Did you know that you can straighten your teeth without the need to wear metal braces? Invisalign uses clear aligners that are custom fitted to your mouth, and these appliances gently move your teeth into a straight line. Many people find that Invisalign is more comfortable compared to traditional braces. Additionally, Invisalign isn’t as noticeable when you are talking with other people. Since the Invisalign trays can be removed, you will have more comfort while eating, flossing, and brushing your teeth. If this treatment plan is right for you, then you will receive a series of trays that will progressively move your teeth into a straight smile. The treatment time depends on the original position of your teeth and the number of aligners that you will need to wear. It is essential that you follow the instructions to ensure that your teeth move in the right way. If you are ready to improve your appearance with a brighter smile, then our teeth whitening treatment might be the right fit for you. Over the years, it is common for the teeth to become stained and yellow. Certain lifestyle habits can cause the color of the teeth to change, and the only way to restore the bright color is with a teeth whitening treatment. When you are ready to brighten up your dingy, stained teeth, then don’t make the mistake of using over-the-counter teeth whitening treatments. Professional teeth whitening services are faster, safer, and more effective than the DIY methods that are done at home. The treatment will immediately improve the appearance of your teeth, allowing you to leave our office with a brighter smile that can be shared with everyone that you see. These teeth whitening treatments can be used to help you achieve the shade of white that you have always wanted. When a tooth needs to be repaired because of a cavity, chip, or break, then we like to use white composite fillings to restore the tooth. In the case of tooth decay, the decayed areas of the tooth are removed, and space is filled in with the composite material. White fillings are preferred because they look natural. The color can be matched to your teeth to allow the filling to blend in with the rest of your mouth. One big benefit to using white composite fillings is that they can bond strongly with the structure of the tooth, including both enamel and the dentin areas of the tooth. The composite materials are hardened with a special light that sets the material. Usually, it is applied in layers to create a comfortable filling for the tooth. Finally, the composite area is polished to improve the feel of the tooth and ensure that it fits naturally within your bite. Custom Dental Website by Unique Dental Marketing.